UPDATE (7/1/2013): We have recently redesigned and reinforced our handles to make them more durable and comfortable when you are cutting. 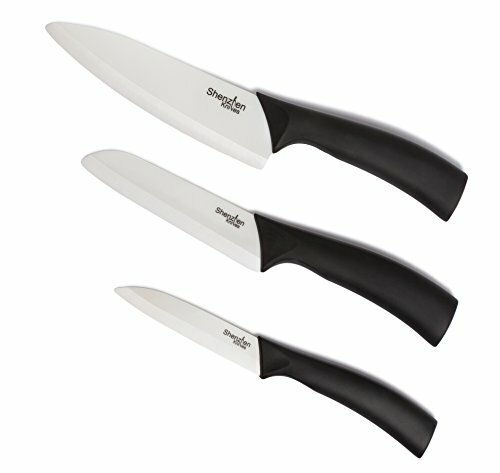 This set includes our most popular 6" Chef's Knife, 5" Slicing Knife, and 4" Paring Knife. The 3-piece set covers all cutting jobs. THE CERAMIC ADVANTAGE Imagine paper thin tomato slices or perfectly diced onions, Shenzhen Ceramic Knives give you precision slicing every time due to ceramic’s special material properties. The blade is made of an advanced ceramic called zirconium oxide that is much harder than steel, and second in hardness to only diamond. Ceramic blanks are produced by dry pressing zirconia powder and subjecting the blanks through an advanced heating process called, sintering. The ceramic blanks are then sharpened and honed to a razor sharp edge and attached to the knife handle. This results in an extremely hard blade that maintains its edge approximately 10-15 times longer than steel knives. That means your ceramic knives can be used longer without resharpening. Ceramic is also non-reactive, which means ceramic knives will not rust and are easy to clean. Because of their resistance to strong oils and acids, they won’t absorb flavors or odors from foods; which won’t leave any after-taste residue on foods that you slice. It also keeps fruit and vegetables from browning as quickly. STEEL KNIVES VS CERAMIC KNIVES Unlike ceramic blades, steel blades are porous, and they can sometimes leave behind an after-taste or residue on the food you’re cutting. And due to its softer material, steel blades lose their edge much quicker than a ceramic blade, and they need to be re-sharpened often. Properly cleaning steel knives to prevent rust is a must as well, as they will corrode eventually, unlike ceramic knives. Because you can’t use ceramic knives to chop or cut through bones, cheeses and other hard foods, ceramic knives will never fully replace the steel knife in the kitchen. You will still need to use your steel knife for heavy duty cutting, but Shenzhen Knives are a perfect complement to your steel knives for slicing fruits and vegetables and other precision cutting tasks. THE SHENZHEN KNIVES ADVANTAGE Shenzhen Knives is the leading online brand of ceramic knives. As a result of our e-commerce only sales model, we can make high performance ceramic technology available to everyone. Even though ceramic knives were first introduced over 25 years ago, the price has not changed much, even with improvements in ceramic technology and manufacturing. We soon realized that there were so many layers of marketing and distribution. At Shenzhen Knives we do not spend millions on celebrity chef’s endorsements, and avoid brick and mortar retailers who need to add their huge markup to cover their overhead. We felt that such a great product –that doesn’t need to be sharpened as often as a steel knife, and knowing the blade won’t rust – should be in everyone's kitchen. CUT BONES: Never use your ceramic knife to pry or cut into bones as this may cause the ceramic blade to chip, or the tip to snap off. STRIKE HARD SURFACES: Do not strike hard surfaces with the ceramic blade (either sideways to crush garlic or blade-down to chop bones) or drop the knife on the floor as the blade may break. If properly cared for, ceramic knives can go years without re-sharpening. However eventually the ceramic blade will develop micro nicks that will make the blade feel dull, and can be re-sharpened using a diamond sharpening wheel. Our Shenzhen Knives electric 2-stage electric diamond knife sharpener is perfect for sharpening both your ceramic and steel knives. OUR PROMISE TO TREAT CUSTOMERS FAIRLY At Shenzhen Knives, we do not have a 100-page customer service policy handbook. Instead, we live by the simple motto of “treat customers how you would like to be treated”. And that is the mandate that guides our interaction with customers. And while most companies don’t want to point out their mistakes, we invite you to look at some of our negative reviews and see how our customer support measures up to other companies. It’s our belief that customer support doesn’t mean much when you like the product or the product works perfectly. It’s only important when something goes wrong, and the measure of a good company is how they react to dissatisfied customers or mistakes. And while we strive to have 0% defective rates on our knives and 100% satisfaction, we realize that mistakes do happen from time to time, and when that happens, please let us know. SPREAD THE WORD! Please write a product review to let others know about our product. As a business with a limited ad budget, word-of-mouth marketing is our life blood and our company relies heavily on them. Thank you for your business! If you have any questions about this product by Shenzhen Knives, contact us by completing and submitting the form below. If you are looking for a specif part number, please include it with your message.